Should Women Swim Differently To Men? ~ Feel For The Water! Advice & Tips to Improve Your Swimming. Home » » Should Women Swim Differently To Men? If we took all the swimmers in the world and thought about segmenting them, an obvious first way might be women vs men. Since most swimming gurus have historically been men, is the standard swimming advice out there under-serving women and if so what should we change? Some of those things are a disadvantage for swimming and some an advantage. Each will have an effect but they tend to cancel out to the point where women swim just as fast as men at the age group level of swimming and triathlon - go girls! Many girls enjoy kick sets and are often markably better at them than men. Why is that? Slightly wider hips means the legs tend to taper in from a wider position and naturally angle the feet inwards (pigeon toed) which is great for kick propulsion. The propulsion you gain contributes a useful push, the body position is lifted up even higher (reducing drag) and providing you don't over-kick (i.e. becoming kicktastic) it is not overly fatiguing to do so. You hear it said time and time again: Look straight down at the bottom of the pool to bring your legs higher in the water but this generic advice fails many swimmers, particularly women. As a rule women have much better natural body positions in the water with the legs sitting noticeably higher than men. Partly that's because of better kicking technique but also because of lower lung capacity (less buoyancy in the chest) and fat being stored lower down the body than men. If you already have a good body position and then try to look straight down you will tend to lose stability in the water and feel awkward. This is doubly worse when strapping on a wetsuit with lots of additional buoyancy in open water. Plus, your proprioception (body awareness) in front of your head is harmed when looking straight down and this is where the catch happens - technically the hardest part of the stroke to develop. Try lifting the head a touch higher and looking further ahead girls - you can maintain a great body position, feel more balanced, develop your catch better and get a better view forwards in open water! We've lost count of the numbers of times we've heard a female swimmer (often in tears) come to us and say that their swim coach has said they must get under 40 strokes per 50m and they just can't do it and what should they do? You might be trying to meet a similar generic target yourself (another common one being 16 strokes in a 25m pool). These arbitrary targets were created by coaches watching male Olympic champions and thinking my swimmers must swim the same way too. The problem is that if you are are 1.6m tall and weigh 55kg you haven't got a chance in hell of matching the stroke length of a muscular 100kg 2m tall male Olympic swimmer with hands like shovels and the wingspan of an albatross. Pro Triathlete Katrina Mercer swimming very effectively at 1:16 /100m, taking 48 strokes per 50m lap. Notice there's lots of rhythm to the stroke and Kat's using her kick to good effect. Our advice - ignore what you might have been told, happily turn the arms over faster and embrace taking more strokes. Notice how the width of the white zone allows significant leeway depending on your individual height and build. If you've been following Swim Smooth for a while, you'll know that we are passionate about the fact that there's no single best way for everyone to swim. Our individual height, strength, flexibility, age and arm length has such a large influence that a single 'stroke blueprint' that everyone should use is always going to fail the majority of swimmers. Instead we need an individual approach that embraces the differences between us all rather than being blind to it - a philosophy we've baked into all aspects of the Swim Smooth coaching program. One of your most useful blog emails EVER. Thank you so much (from a 1.64cm 55 kg female Bambino!). Really helpful to have aa clearer guide on stroke rate as I have just got a tempo trainer but no real idea of what rate I should be aiming for. Really interesting however I am off the chart, with an average pace of 122/100m and a stroke rate of 22/min it looks like I need to more than double my stroke rate to around 52. Is this correct ? Hi, how do you determine the centre of buoyancy? It's the same point as the centre of gravity? I'm hopeless with kicking sets, most women go faster than me in the pool even if I can swim faster. Is it possible to lower the centre of buoyancy? As a novice swimmer, female, 176cm, 64kg, skinny with sinky legs, the flexibility of an iron bar but without the muscle strength of a male to compensate, I can't help feeling I'm doomed! @Ali Maybe you are a big overglider?? Sounds like could make a difference and well worth at least trying a faster rate. Maybe you could try some version of a ramp test - where you give faster stroke rates a test and gauge speed/effort. Made me realise my stroke rate needed to be lifted quite a bit and it all helps. 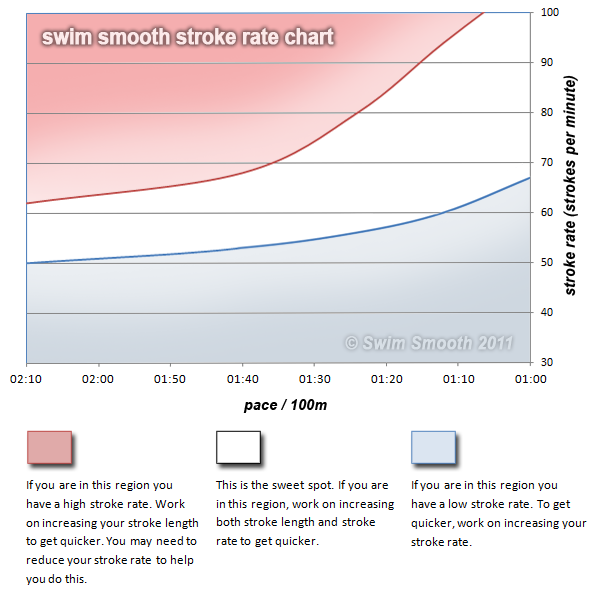 There is advice on the Swim Smooth site. This article has been the most informative for this lady! I am an aging athlete just getting into short distant tri. At one time in my life did competition swimming and have been away from swimming for a few years. Now at age 55 trying to figure it all out again and noticing my natural ability is still with me, just a little slower than I used to be. This article is one for the girls that this girl needed to know where her head should be in relation to her againg body. For this post...thank you, thank you!! Many thanks for the feedback & advice I'll give it a go ! just remember Ali, the Swim Smooth guys count both armstrokes whereas at 22/min you may be counting the double/complete arm stroke as one? Superb article. One other female factor is that they tend to be less angular and more rouned partly due to skeletal differences and partly due to different fat distribution pattern and this probably makes them are more aquadynamic. Most aquatic mammals tend to have a similar profile ie seals, dolphins etc. PS: the clip of Katrina Mercer is mesmerising. Poetry in movement.